Nature, imaginative by necessity, has already solved many of the problems we are grappling with. Animals, plants, and microbes are the consummate engineers. They have found what works, what is appropriate, and most important, what lasts here on Earth. we can from what works? This week’s guest, JAY HARMON is doing just that, translating nature’s lessons and models into technologies that solve problems and perform tasks more elegantly, efficiently, and economically. 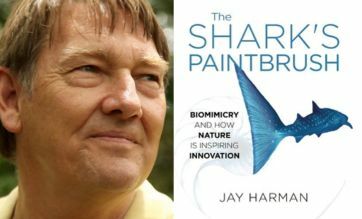 He’s the author of THE SHARK’S PAINTBRUSH: Biomimicry and How Nature is Inspiring Innovation. I believe biomimicry – a way of looking and working and designing – has enormous potential to save us from ourselves. I find this one of the most exciting developments in the world at this time.